My initial adventures in ramen dining in England proved to be amateurish when, years later, a move to a major city (New York) with a sizeable Japanese expatriate community redefined my preconceived notions of authenticity, thanks to the restaurants associated with said expat population. Not surprisingly – and increasingly in the last few years in particular – this diverse quantity of restaurants includes a proliferation of ramen joints. Kogashi miso ramen – not the Ippudo version, but from Toraya, a restaurant in the famed Ramen Yokocho Alley in the city of Sapporo, Hokkaido, Japan. Lighter than its Ippudo cousin in terms of color, texture and broth, the small black specks dusting the pork and the soup indicate blackened miso, which was roasted in a large wok before it was added to the bowl. Such wisdom has been parlayed in a brochure on “How to enjoy Ramen” published by Ippudo, a Tokyo-based ramen restaurant that has made its way overseas to Singapore and the United States. Each outing to the Ippudo branch in New York, whether it included an offering from the standard – if such an adjective can be applied – menu or one of its seasonal specials tends to start with a combination of giddy anticipation and pent-up frustration in the wait to be seated, and end with satisfaction when one’s taste buds have finally been sated. For me, the most memorable Ippudo run to date took place about nine months after the New York branch opened. Tuesday, Dec. 30, was not the last day of 2008. But it was the last day of the year for Ippudo and, more importantly, the last day of the restaurant’s month-long, limited-edition roasted miso ramen special. That said, there are benefits to the solo ramen run, particularly when it comes to Ippudo. No matter what the time of day, there is a line out the door. Well, make that a mob. As I pushed through the crowd of people entering, exiting, milling and waiting around on a 35-degree Fahrenheit evening, I knew that declaring a party of one was equivalent to a Monopoly “Pass Go.” To put this into perspective, one guy ahead of me in line checked with the hostess on his “party of two” status. “You’ve only been waiting here for 30 minutes,” she reassured him. The waiter actually didn’t believe me. He mentioned that the restaurant offers two kinds of miso ramen, and suggested that I might be referring to their “regular” miso ramen, a worthy adversary with its thicker-than-usual hearty broth. “It’s oily,” he told me of the Kogashi offering. “I know,” I replied, looking him square in the eye and smiling. “I’ve had it twice. And today is the last day, right?” And, by the way, was there any chance that Ippudo could add the dish to its daily menu? And, I added, could he throw in some extra pork belly (kakuni) in my bowl for good measure? She asked me what I thought she should order. I told her she was in luck and showed her my bowl. “This is the last day that you can try this,” I said. So she ordered it. Since that cold December day in 2008, the kogashi miso ramen briefly made an appearance in the regular menu, then disappeared. It has now returned to Ippudo for a seasonal dinner run until the end of February 2011, in both a spicy and non-spicy format. Ippudo, 65 Fourth Avenue (between 9th and 10th Street), New York, NY 10003, Phone: 212.388.0088. 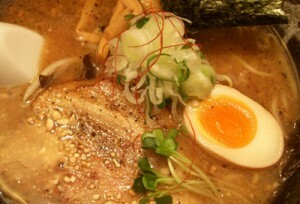 For more information, go to www.ippudony.com. This “Ramen Run” column is the second in an autobiographical series about the Japanese noodle by Editor-in-Chief Yuan-Kwan Chan.